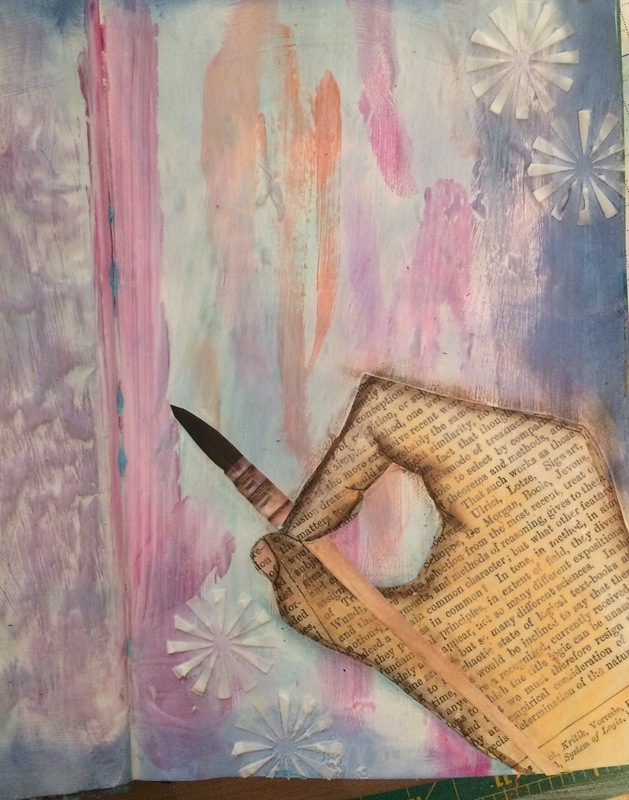 Working in mixed media on an art journal is good for my soul. 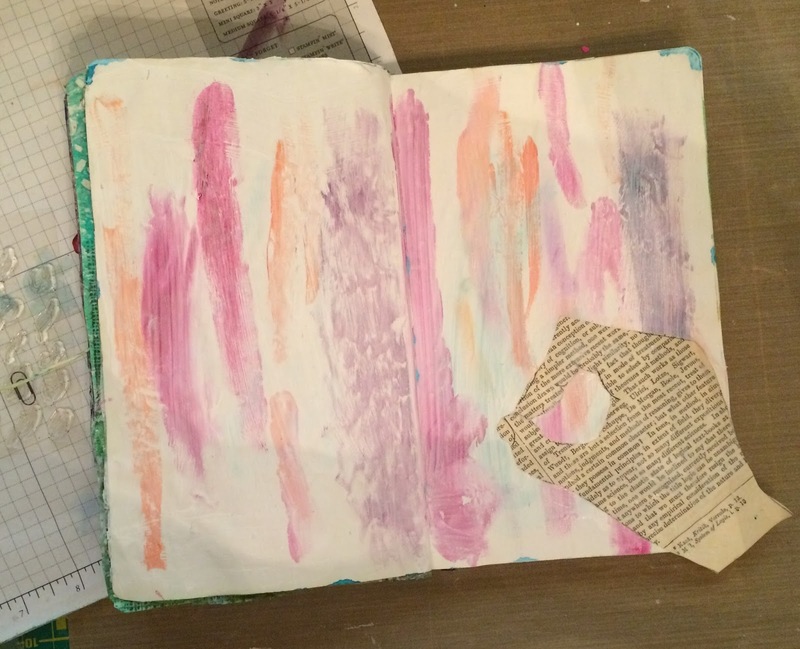 There are amazing art journals out there to see, but remember the point of a journal is to express your own self and practice skills. There is no room for perfection because creativity is taking over! Sometimes when I want to create an art journal page it exists fully formed in my mind and I just copy it in the journal, but other times I'm not quite sure where I'm going until I'm already started on the journey. I'm telling you this, so you will feel free to just begin. It can be quite exciting to not know where your going to end up. This page began a while ago when I was working on another project. Art materials can be pricey and I hate to waste, especially paint. So with no other thought in my head, I just wiped extra paint on an empty, but gessoed page. Once I realized I had a streaky pattern, I went with it. Just looking at the page made me happy. 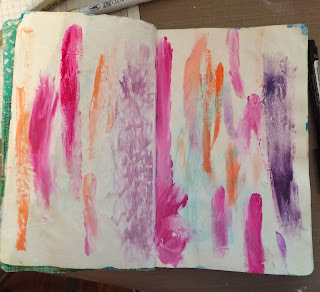 This week I felt like working in my small journal so I gave these pages a light gesso wash to mute the colors. I pushed the streaks into the background so they wouldn't compete with my focal images. The idea was about creativity and not perfection. I went to Graphic Stock to find a picture of a hand holding a brush. I didn't find that, but a hand holding a pencil was close enough. I printed it out. And now I'm going to reveal a secret. I am not good at drawing, so I use graphite paper. I lay it on my project, put the image on top and trace over it. Graphite paper transfers a thin, dark line on many surfaces. Even book paper like I used on the hand. I use Matte Medium Gel to adhere things. It works great for me. I also seal the image by painting the gel medium over the top. This way inks, and other mediums don't sink into the image, but are easier to move around. I watched the prices on Graphic Stock until they dropped under ten dollars a month. I find images all the time--for school and art projects. You can also find plenty of free images on line. I prefer vectors that are easy to adjust the size without getting fuzzy. If you look at the page, you can see a rather lifeless hand on a plain background. This page needed depth of color and shading. It is also crying out for texture. First I framed the page by edging in Chipped Sapphire Distress Ink. 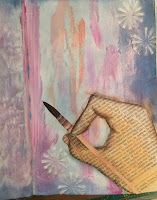 Then using texture paste and a stencil I added the starburst with my favorite spatula. It game with the Gelatos. Gelatos in white and peach shaded the hand. Just scribble and smear with a barely damp finger. I shaded the hand with a brown Pitt Big Brush marker, and around the hand with a blue marker. I took a small stamp from Doodle Blossoms Stamp Set and stamped it in Distress Chipped Sapphire because it was similar to the stencil. I went back to Graphic Stock for a paint brush. Cutting it and two in the appropriate spot and gluing it down finished the hand. Now for the words: I wanted to contrast the idea of perfection with creativity, so I printed the words on the right and mimicked the style on the right. I made the decision not to frame the word creativity or highlight it. I think it has a homemade feel like it is. 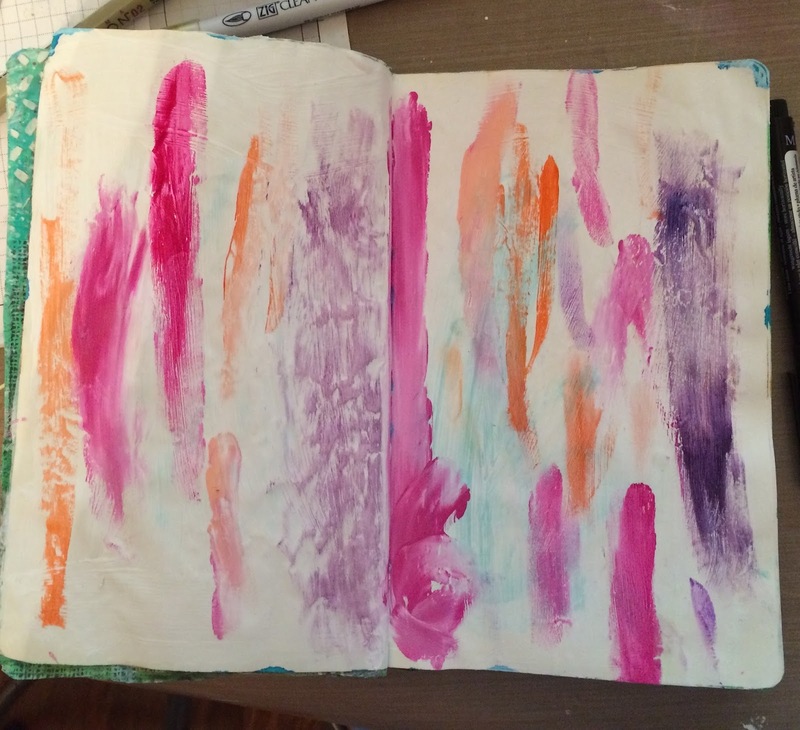 So here are the basic steps to art journaling. Materials used:Materials: All projects feature my products from Pink Bunkadoo or are affiliate links.